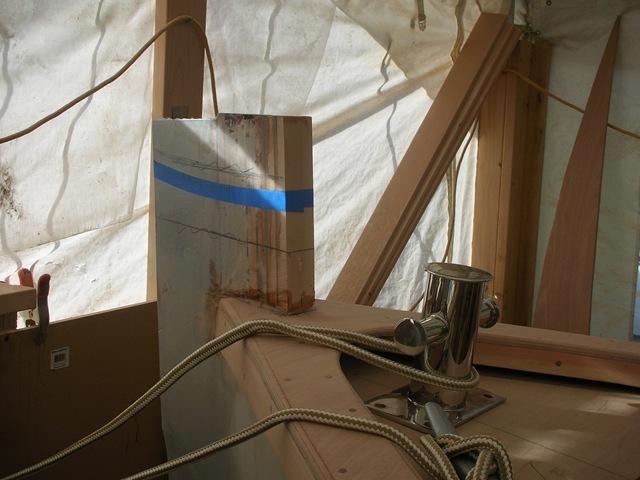 I’ve got the parts fitted for the chain locker in the bow. Next weekend should see it installed and glassed. I like the kick space below, like a kitchen counter. It lets you stand right up to the locker. There are two large scuppers so I can throw a bucket of water in the locker to wash it out. The wide panel on the side of the cutout will hold the shore power socket. I assume I’ll moor bow-in most of the time so this will be the least annoying place to run shore power from. I’ve seen too many boats where the power cord is in the way all the time. I tried various layouts of cleats and bollard locations. I like this layout best so far. 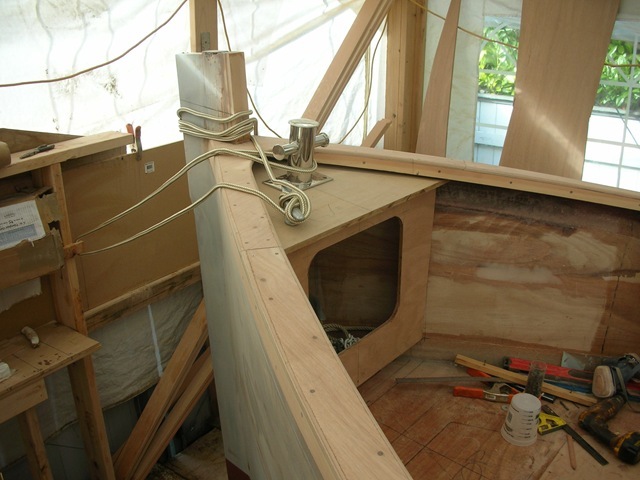 Note the plywood cap on the gunnels – it really makes the boat look more finished. I need to do some more longboarding before glassing the caps. I’ve got a bit of a dilemma with the bollard – I found a very pretty bronze one that would look great there. I have to decide if I want to return this one. Hamilton Marine sells bronze cleats too. I’m trying to decide where to cut the stem. It’s going to be time to finish the whole bow area soon. Non-boating note: I spend a lot of time on the West Marine site. It’s a good store, but the web site itself is a mess. It’s one of the least-optimized web sites I’ve run across. They break at least ten of the of the 14 rules. For all of last week they had a missing CSS file too. It’s annoyingly slow to browse around on. I bet they could speed up their pages by 50% with just a few weeks of work.